In Debug mode, you can use several views to interact with the program you are debugging. Frequently used views are shown by default and rarely used ones are hidden. To change the default settings, select Window > Views, and then select views to display or hide. By default, the views are locked into place in the workspace. Select Window > Views > Locked to unlock the views. Drag and drop the views into new positions on the screen. Drag view borders to resize the views. The size and position of views are saved for future sessions. To start a program under the debugger's control, select Debug > Start Debugging > Start Debugging, or press F5. Qt Creator checks whether the compiled program is up-to-date, rebuilding it if necessary. The debugger then takes over and starts the program. Note: Starting a program in the debugger can take a considerable amount of time, typically in the range of several seconds to minutes if complex features (like QtWebKit) are used. Once the program starts running, it behaves and performs as usual. You can interrupt a running program by selecting Debug > Interrupt. The program is automatically interrupted as soon as a breakpoint is hit. Updates the Registers, Modules, and Disassembler views. To execute a line of code as a whole, press F10. To step into a function or a sub-function, press F11. In Mac OS X, external libraries are usually built into so-called Frameworks, which may contain both release and debug versions of the library. When you run applications on the Mac OS desktop, the release version of Frameworks is used by default. To step into Frameworks, select the Use debug versions of Frameworks option in the project run settings for Desktop and Qt Simulator targets. Typically, breakpoints are associated with a source code file and line, or the start of a function -- both are allowed in Qt Creator. At a particular line you want the program to stop, click the left margin or press F9 (F8 for Mac OS X). At a function that you want the program to interrupt, enter the function's name in Set Breakpoint at Function... located in the context menu of the Breakpoints view. By clicking the breakpoint marker in the text editor. By selecting the breakpoint in the breakpoint view and pressing Delete. By selecting Delete Breakpoint from the context menu in the Breakpoints view. If you click a frame with a known source location, the text editor jumps to the corresponding location and updates the Locals and Watchers view, making it seem like the program was interrupted before entering the function. If a multi-threaded program is interrupted, the Thread view or the combobox named Thread in the debugger's status bar can be used to switch from one thread to another. The Stack view adjusts itself accordingly. The Modules view and Source Files views display information that the debugger plugin has about modules and source files included in the project. The Modules view lists the modules in the project and symbols within the modules. In addition, it indicates where the module was loaded. By default, the Modules view and Source Files view are hidden. The Disassembler view displays disassembled code for the current function. The Registers view displays the current state of the CPU's registers. The Disassembler view and the Registers view are both useful for low-level commands for checking single instructions, such as Step Into and Step Over. By default, both Disassembler and Registers view are hidden. Whenever a program stops under the control of the debugger, it retrieves information about the topmost stack frame and displays it in the Locals and Watchers view. The Locals and Watchers view typically includes information about parameters of the function in that frame as well as the local variables. Gdb, and therefore Qt Creator's debugger works for optimized builds on Linux and Mac OS X. Optimization can lead to re-ordering of instructions or removal of some local variables, causing the Locals and Watchers view to show unexpected data. 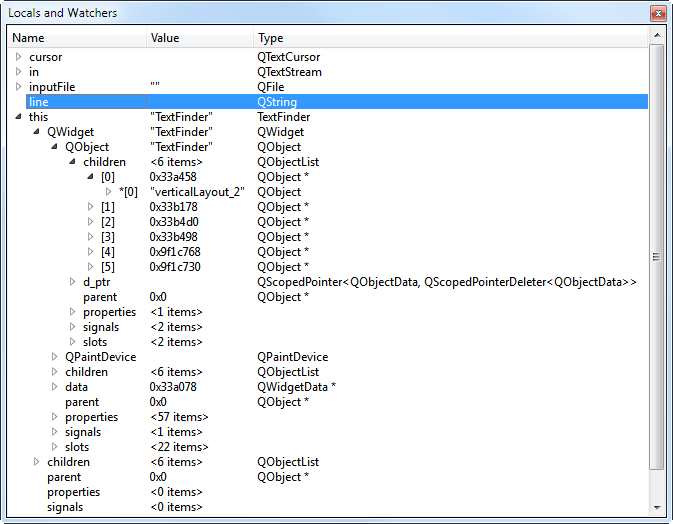 The Locals and Watchers view also provides access to the most powerful feature of the debugger: comprehensive display of data belonging to Qt's basic objects. Select Tools > Options... > Debugger > Debugging Helper and check the Use Debugging Helper checkbox. The Locals and Watchers view is reorganized to provide a high-level view of the objects. For example, in case of QObject, instead of displaying a pointer to some private data structure, you see a list of children, signals and slots. You can use the Locals and Watchers view to change the contents of variables of simple data types, for example, int or float when the program is interrupted. To do so, click the Value column, modify the value with the inplace editor, and press Enter (or Return). Note: The set of watched items is saved in your session.